“Remodeled English Basement Studio Apt in corner house in Woodley Park. One block from Metro. 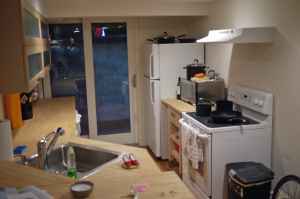 Separate new kitchen with washer/dryer and dining area. Utilities with premium cable/internet included. On quiet street just blocks from Adams Morgan & Dupont and National Zoo. Woodley Park metro stop just up the block. Easy street parking. Quiet pets may be considered with additional security deposit. Does $1300 sound right for this 1 bedroom? Dear PoP – Has Stanton Dog Park Been Removed?